Is the third time a charm for a 3D Castlevania? Find out as we take a deep, long look in our review of Konami's latest. Just in time for Halloween!!! Leon Belmont gets his hands around the whip this time around for what is actually the origin of the Castlevania mythos. It’s pretty popular to be jaded these days, and gamers tend to be a fine example of this fact. We scrutinize that which is not innovative and inspired, and yet at the same time we tend to condemn changes to that which we love. Sequels are a dangerous game, and as Konami found out when they moved the Castlevania series to 3D on the Nintendo 64, gamers can be a spiteful crowd. 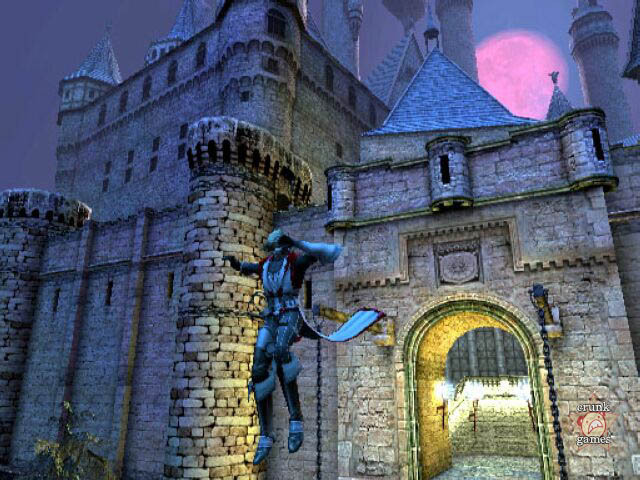 Of course, it’s hard to blame Castlevania fans for their polygonal backlash – while some will argue that the N64 Castlevania games weren’t as bad as critics make them out to be, it’s unanimously agreed that they simply weren’t on par with their most recent predecessor, PSOne champion Symphony of the Night. With shoes the size of SotN’s loyal fan base to fill, it shouldn’t be too much of a surprise that Konami’s N64 efforts fell shy, especially when the team that made SotN wasn’t involved. The irony of the outcome is that the N64 Castlevanias, Castlevania 64 and Castlevania: Legacy of Darkness, could have flopped just as bad as advanced two-dimensional titles. The Castlevania series has hardly remained static throughout the last 17 years; new games in the series have varied from pure action titles to heavily RPG-influenced adventures and many shades of grey inbetween. When it came time to place blame for the N64 titles’ failure, the most obvious difference was chosen: The games were presented in 3D, and therefore 3D is bad. This allusion was further aided by the fact that since then, three highly acclaimed 2D Castlevanias were released for the Game Boy Advance, the latter two of which were lead by SotN producer IGA. When Castlevania: Lament of Innocence was announced, reactions were of course once again mixed. Many flashed back to the failures that were Castlevania 64 and Legacy of Darkness, but at the same time the announcement demanded respect, as how could we be lead wrong by the man who brought us Symphony of the Night and, more recently, Aria of Sorrow? It began to look like the series was once again heading for change, which is as common of a theme in the Castlevania universe as is vampires. The moment Lament of Innocence boots up, IGA’s influence is felt. A few minutes of backstory are delivered via onscreen text, very similar to SotN, along with (much improved) voice acting and an intro track by composer Michiru Yamane (also of SotN). Slowly, the player is introduced to Leon Belmont, 11th century knight who has given up his title so he can be free to go after a vampire who has kidnapped his beloved and taken her to a castle in the nearby woods. The story to be told is that of the first Belmont to take up the whip against vampires, the time when the entire Castlevania universe was being born. Lament’s introduction does just enough to settle the player in comfortably, letting them know that-number of dimensions be damned-they’re getting ready to play a Castlevania game. In fact, there are enough influences of the past six years of 2D Castlevanias felt in LoI that it winds up not feeling like the departure which many were expecting. It’s been commented on numerous occasions that Lament is a more action-oriented title becaue it’s "Level Driven" and not as non-linear as IGA’s past titles. Calling Lament level driven isn’t exactly accurate, however. The entire game is map-and-exploration derived, much like the previous non-linear Castlevanias, but the different areas are available via one central hub. However, once you’re in an area, it’s just like being in a new portion of SotN’s castle. 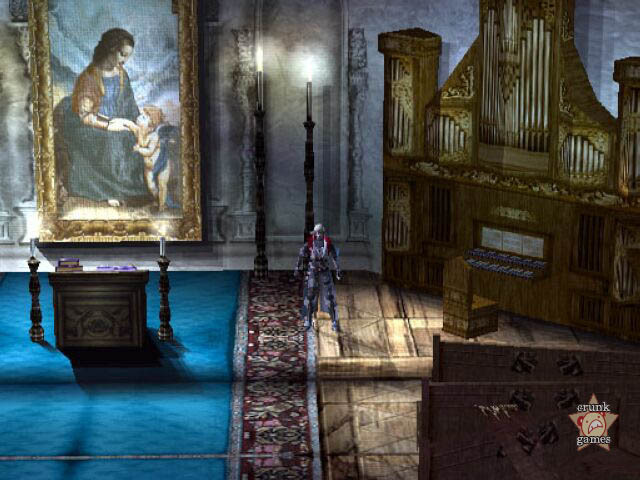 The best way to think of it is like a SotN where all different areas connect to one central room, but do not interconnect amongst themselves. Once you are in a certain area of Lament, you will find areas in your exploration that are not accessible at present. Some doors will require keys which you do not have, and some rooms physical abilities which you’ve not yet obtained. The exploration factor may not rival that of IGA’s previous Castlevania games, but Lament is far from the level-based sidescrolling Castlevanias of old. Perhaps the greatest success in Lament of Innocence is the near perfection of its balance. All five main areas of the Castle, as well as your home base, are immediately accessible from the start of the game. The mysterious alchemist Rinaldo has shop set up just outside of Dracula’s castle, with transport cards which which to make a hasty retreat from the Castle to Rinaldo’s shop being available for a cheap price. Rinaldo will supply you with equipment and items, and the hub area of the castle is easily accessible within two rooms of reentering. The fluidity of this layout is made more apparent as your playtime increases; players will find themselves moving through different areas, obtaining items and unlocking doors to aid advancement in either the current area or another. Being able to teleport to Rinaldo’s shop often saves needless backtracking, and money is easily enough available to aid your return and keep necessities in stock, but not so abundant to keep you from having to work hard to buy better armor. This all plays importantly into the harmony of the combat system, which itself is well-balanced and complements the castle design seamlessly.Leon does not gain experience or levels in the RPG fashion which Alucard and his GBA followers did – the only time Leon will see a change in stats is when one of four pieces of equipment are changed (Whip, Armor, and two Accessories), or when he acquires a special HP / MP / Hearts Max Up item. As all five main areas of the castle are available for adventuring from the start of the game, the same basic enemies fill the main corridors. However, as Leon travels and unlocks additional areas in these maps, more powerful enemies will begin to rear their ugly, undead heads. Luckily, while Leon may not gain levels, he does gain techniques. Leon begins the game with simple three-hit combos available, but the more he fights, the more he learns. 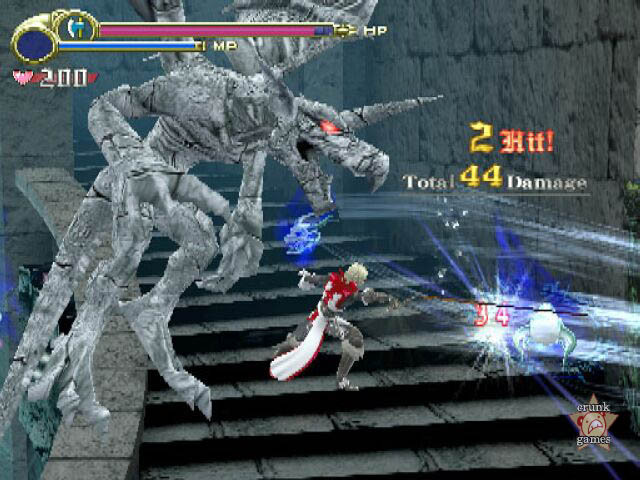 Leon’s available moves grow continuously throughout the game, whether it’s increasing the number of attacks available in his combos or adding new defensive techniques. Within a few hours of fighting, Leon will be doing high-speed duck-and-rolls, performing guard-impacts to steel an enemy’s magic, attacking while high-speed dodging, and more. Some of these techniques may seem to be simply thrown in for flash at first, but each technique becomes increasingly vital as your enemies become increasingly difficult. 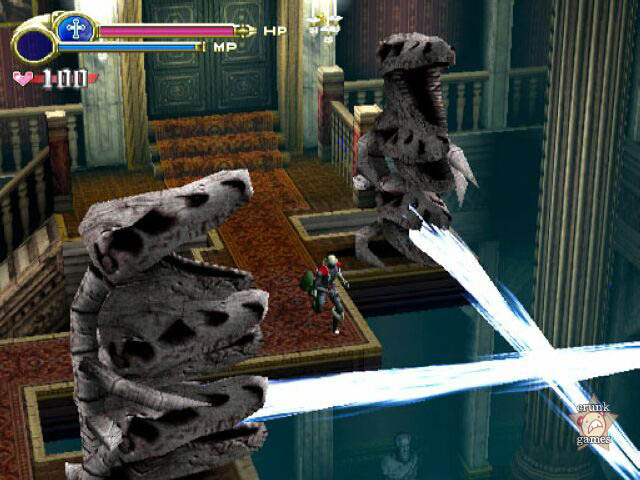 The classic subweapons of the Castlevania series are also immensely helpful in Lament; while the original incarnation of each weapon may seem same-old, Leon is able to alter how each subweapon attacks by switching which Orb he has equipped. The Orbs, which are obtained by defeating the major bosses of the castle, bestow certain abilities to each subweapon that a skillful player can constantly switch around to make the best of each situation. Rounding out Leon’s repertoire are magic relics, which are both very powerful, and very well hidden. Different magic spells will be available, varying by which Relic Leon has equipped. Of course, just as important to the gameplay as the crafting of its layout is how well that layout is executed. Thankfully, Lament delivers. In battles, Leon responds to the controller quickly and seamlessly. The ways in which characters can tie attacks together is left extremely open; the battle system allows constant switching from light attacks to heavy attacks, with mixups of subweapons and magic thrown inbetween. There is no pause or delay in action when switching between these tactics. As fast as you can punch in moves, Leon can pull them off, even including changing directions of individual attacks within a single combo. Oddly enough, the gameplay outside of combat seems to fall a little short in comparison. Lament uses a fixed camera, giving the player no control. In nearly all rooms with fighting, this is done very well and the player never really struggles to find their target. However, in some rooms which require Leon to break out his acrobatic skills, the camera seems intent on punishing the player. Sometimes, you’ll find yourself in a situation where you need to perform a multiple-jump sequence that includes using your whip to do a few swings, but the camera lines up so that you can only see the first jumping target. You know there’s more to it, but you’re not going to see it until you’re midair. Other times, you may find yourself forced to run from a trap, such as spikes coming up from the ground, but the spikes may be coming from around a corner which the camera currently has blocked. The desire to use a fixed-camera in a 3D adventure game like Lament is understandable, as manual camera controls are easily made sloppy by the player, but in the above cases the ability to switch to a stand-still 1st person view from which to look around would’ve been a welcome addition. More so, object interaction often seems awkward; if you have a small crate that you need to jump on top of, it can easily prove more difficult than you’d expect. Jump while standing directly in front of the object, and Leon just jumps straight up (despite the fact that he easily cleared the object’s height). Take a few steps back, and it’s hard to get him to land on the crate without over-jumping. Luckily, the above complaints are rare occurrences and are not encountered often enough to hinder traveling. Journeying about often proves very enjoyable, especially given the beautiful look and sound throughout the world of Lament. The character models are both detailed and fluent, and they well represent the designs of series artist Ayami Kojima. The character movement animation is exceptionally vivid, both in terms of how lifelike every action is, and how fluidly they’re animated. No matter how many odd change-ups you throw into your battle commands, Leon (and notably, his whip) respond completely naturally. You never really see any animation glitches caused by bad action transitions. Likewise, every room in the castle looks gorgeous – excellent lighting and texture work make the gothic designs of this 11th century castle fit the Castlevania world perfectly. Meanwhile, Michiru Yamane has once again astounded with a score so perfect and fitting that it’s almost scary to think how well she understands the Castlevania universe. Unfortunately, while every room in the castle is visually beautiful, the effect is somewhat dulled once you realize how similar nearly all rooms are. Within each area of the Castle, there are really no more than ten basic types of rooms and hallways. Furthermore, the difference between major areas of the castle are reminiscent of palette-swapping techniques used in old RPGs; the "Garden" area is typically only varied from the main castle area by occasional vines on the wall. The layout of some areas also leaves much to be desired, often following a basic room-hallway-room-hallway approach.